Ready to take your Cisco knowledge to the next level or achieve your Cisco certification? Our flexible training methods let IT pros choose their preferred learning style, while our expert team helps maximize your certification budget by optimizing key training paths. It’s time for a new approach to IT training—and it all starts with New Horizons. Whether you are new to Cisco, or ready to advance your existing skills, New Horizons Learning Group provides the necessary training to achieve Cisco certification. Our hands-on lab environments allow students to experience real-life scenarios during their Cisco training that can easily carry over to on-the-job skills. 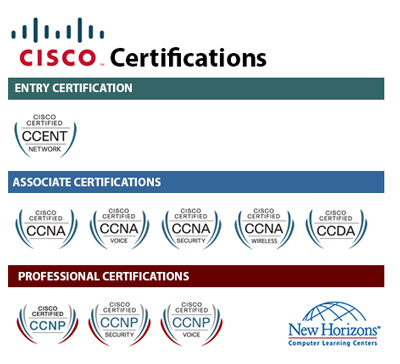 As a Cisco-Authorized training partner, New Horizons Learning Group is a trusted training provider of Cisco technologies. Through our partnership with Cisco, New Horizons Learning Group offers Cisco learning credits to help organizations save on training with pre-paid credit bundles. With the integration of Cisco training into your network solution, your team becomes more efficient, granting your business a competitive advantage. Cisco Learning Credits may be purchased with any Cisco hardware, software, or services order, or they may be purchased on their own. They are sold in packs of 10, 100, 500 and 1500 and each credit is worth $100 towards training at New Horizons Learning Group. "I cannot tell you how much my skills from New Horizons has positively affected my life at work. The skills I've learned are going off the chart. New Horizons and OneStop gave me the opportunity for CompTIA Network+ and CCNA training which is making me glow at work. I am so appreciative to Lisa, Jeremy and Marcy from OneStop...oh and Marcus who is an awesome IT Mentor. My life has been forever changed. I strive to grow and learn everyday. It all started with my lay-off from Boeing. I thought my life was over. Not so. I am doing so well and I want you to share this with you. You’re awesome. I had to stop and say Thank You from the bottom of my heart. I was thinking of all my thankfulness as the year winds down."